Two of Bristol’s most inspirational businesswomen are to take part in a new series of talks backed by UWE’s Business School and Business West and staged at one of the region’s top hotels. 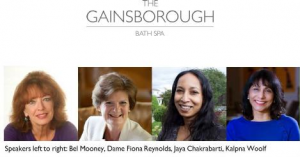 The Gainsborough Bath Spa launched its Phenomenal Women talks last year with the aim of celebrating, supporting and inspiring women in business. Among the speakers were Katherine Bennett OBE, Airbus senior vice-president – who has been in the media this week defending the aerospace giant’s views on a no deal Brexit – and Laura Marshall, managing director of Bristol-based Icon Films. Following the success of 2018 series, the Gainsborough Bath Spa has teamed up again with the UWE’s Business School to stage four events. Business West, the organisation that runs Bristol Chamber of Commerce and the Bristol Initiative, is also supporting this year’s series of talks, which take place between February and November. 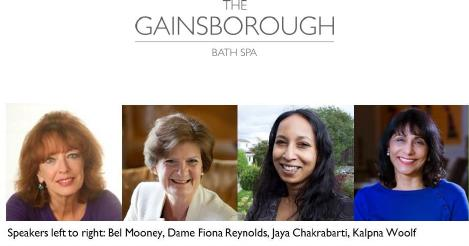 For the 2019 series, The Gainsborough has invited Bristol-based social and business entrepreneur Jaya Chakrabarti MBE and Kalpna Woolf, also based in Bristol and head of production at HungryGap TV Productions and founder of 91 Ways to Build A Global City – an initiative aiming to bring greater understanding, break down barriers and build a more cohesive city.